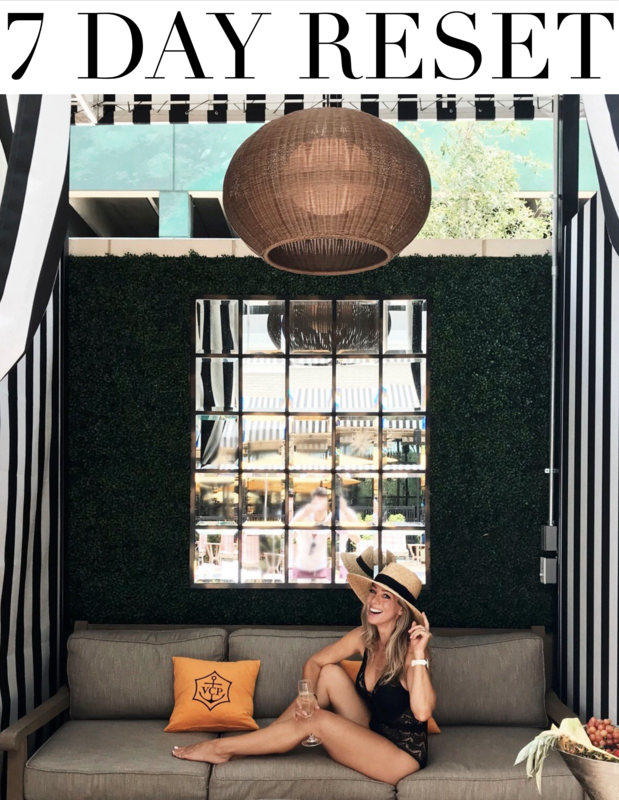 Has this been a whirlwind week or what?! I nearly had a panic attack realizing how close Christmas is and wanting to make sure we get Christmas gifts for the kids! James only had a few things on his wish list, including an iPhone7 and gaming computer. ? He’s 6! Not gonna happen, but a kid can dream. He also had other things like Nerf gun and the book, United Jokes of America, so it’s a start! Between the teacher gifts, school parties, white elephant adult party, work party, and baking, wrapping, decorating, I’ve been hustling this week to get things done because we all know, next week, when the kids are out of school, ain’t nothing productive happening! I’m so ready for that! Today, I’m sharing some “Outfits Lately” things I’ve been wearing here and there when I’m out of my pajamas and the good news is, lots of it is still available and marked down! Warning: Don’t go to Target in the evening in December! It’s packed! My son needed Santa pjs for school pics in the morning and thankfully they had his size! I’m not even mad it rained today because it gave me an excuse to try out my (kids) Hunter rain boots for real! Verdict: ?! You can read my rain boot review here and if you want to try the kids’ version, just subtract two from your normal size. Oh, this sweater I’ve been in all weekend (prob needs a wash, but that’s besides the point) is the perfect lightweight v-neck. Just ordered it in tan too since it’s on sale now 40% off! Dressed up to run some errands but kept my comfy flats in the car just in case! 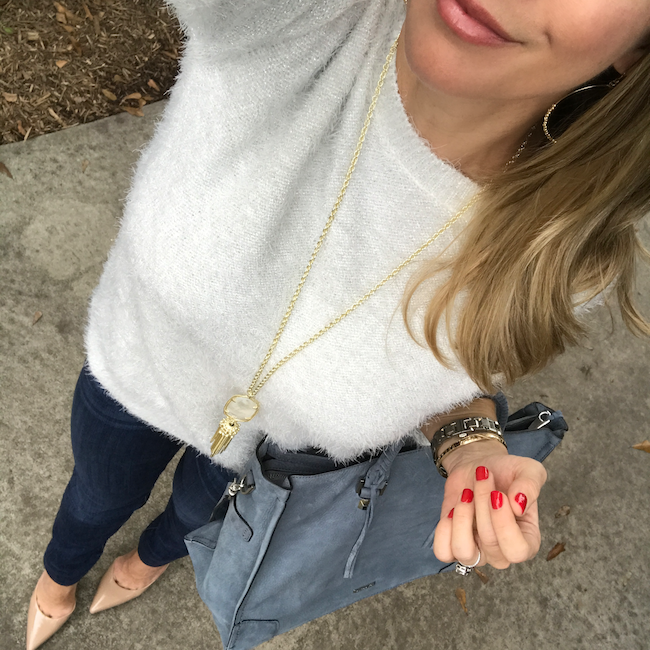 This outfit will be making an appearance at a friend’s holiday party too since the softest lash sweater has a bit of metallic in it. The sleeves are 3/4, which I love too! It runs a little big, I’m in XSP. Cold shoulders is right! This trend makes no sense when it’s ❄️❄️❄️ but I love it anyway! ? 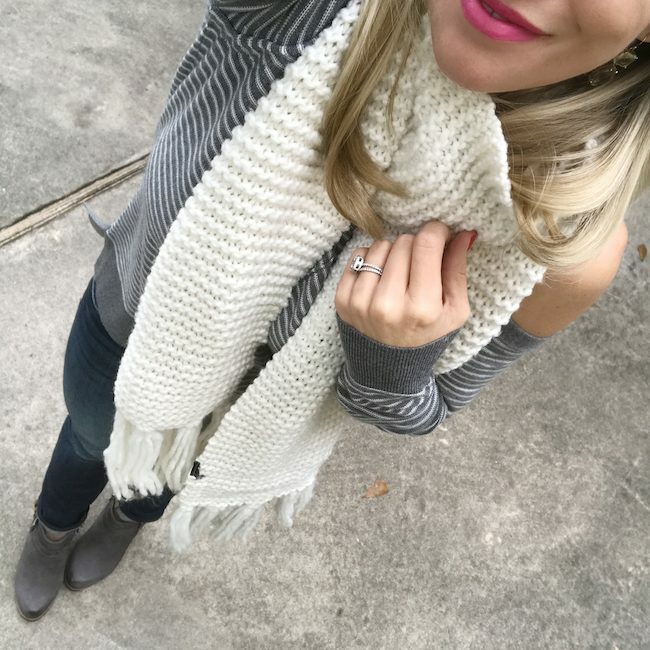 My wedge booties are still on major sale & so is a duplicate of this chunky knit scarf! The booties are my “ohmygoshthesearesocomfywearalldayboots” ! 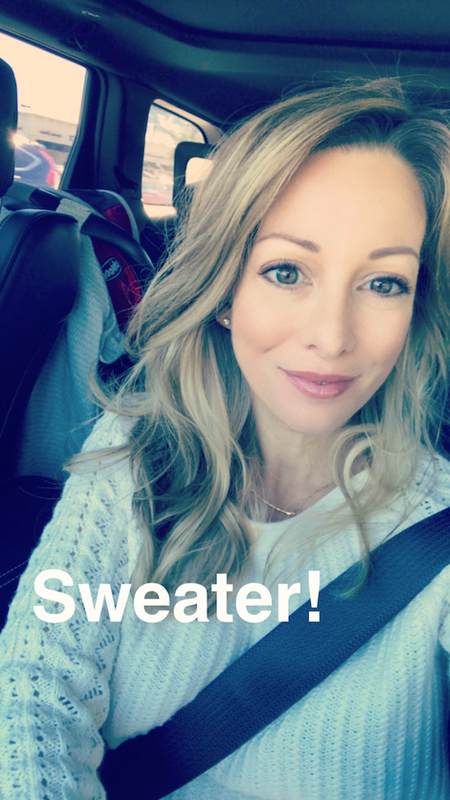 I had to laugh and document this ‘sweater weather’ when in the same car was my husband wearing a t-shirt! 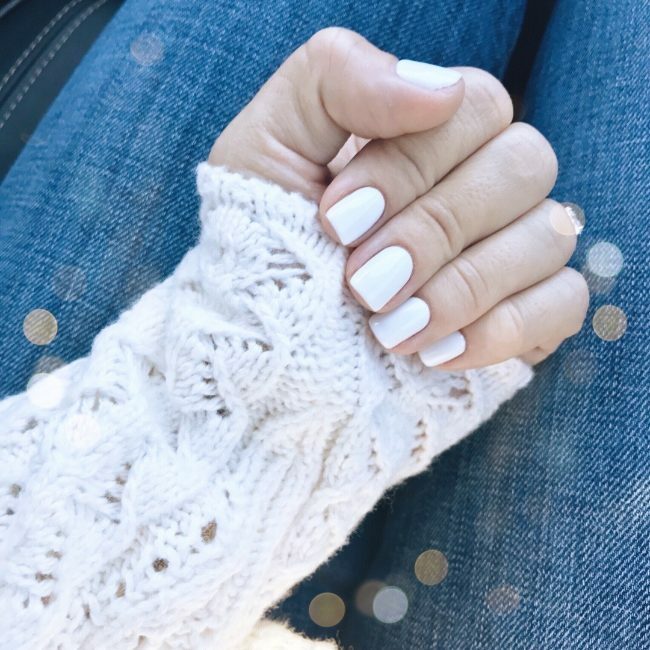 The sleeves on this sweater are so pretty and go great with winter white nails! I swear these bootcut jeans make you look like you have legs for day! If you wear them with a pointy toe shoe, they look even longer. These have a nice bit of stretch in them so size down as they’ll stretch during the day with wear. It’s a clear blue skies w tassels blowing in the breeze kind of day! ☀️? I made dinner early and got Jordan an adorable pair of pink moccasins & boots for cold days to keep her toesies warm! ?Also, happy to see my MK bag finally go on sale again (30% off w code FRIEND). It’s perfect for us organization lovers bc it has compartments and zips closed! 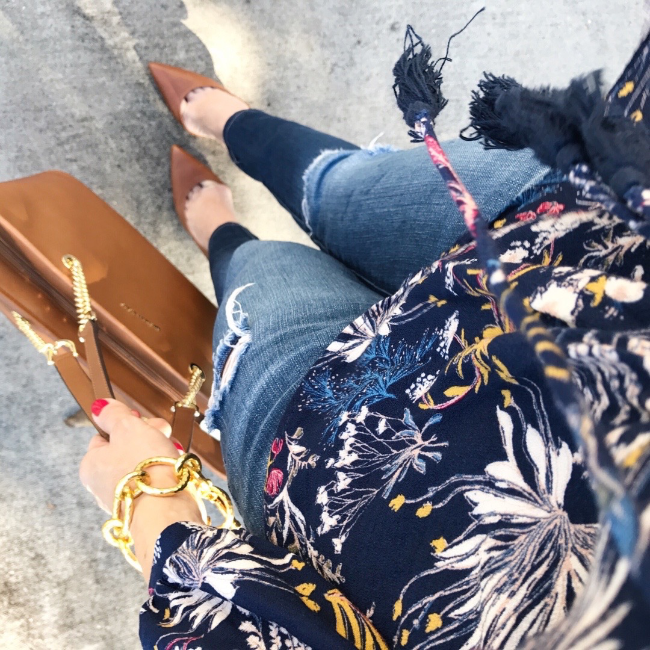 Blouse is on sale (under $30) and warm tan heels in my fave style only $52! It’s a great day! ? 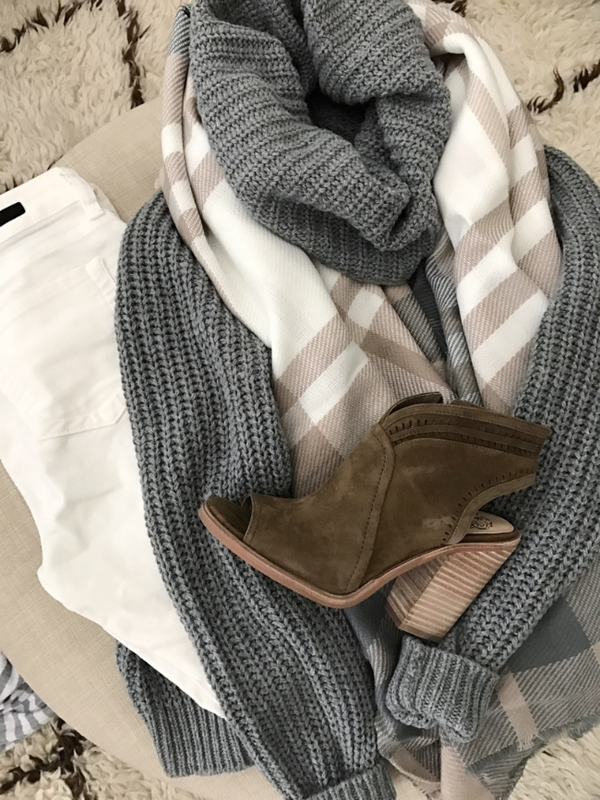 I’m still crushing on winter white and chunky knits! Such a pretty combo! Y’all were asking about last night’s #OOTN (holiday work party) so here ya go! 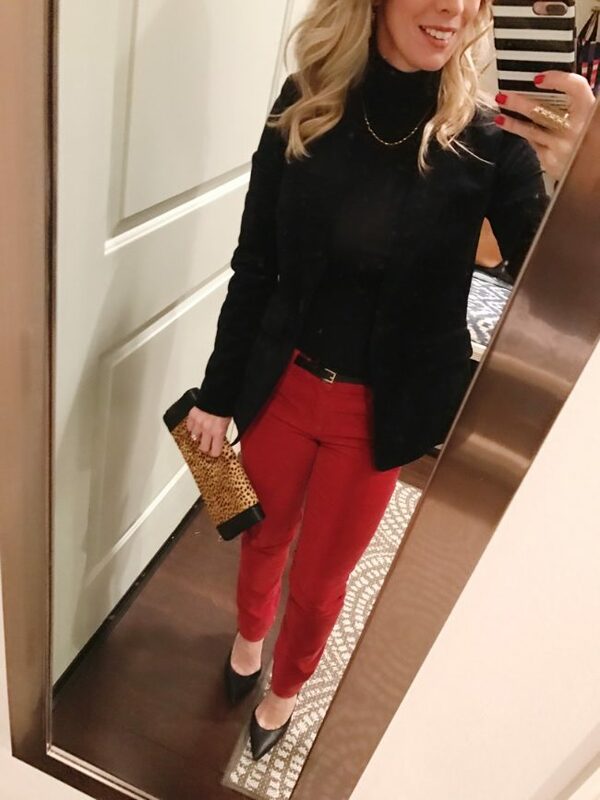 ?Red skinny corduroy pants are so festive (on sale too @Loft) & black velvet blazer feels so luxe ?! . The grey sweater I’m wearing in our holiday home tour just went on sale. It’s a cute cut with ribbed detail on the chest and shoulders and also comes in pink and teal. I took a chance on this sassy olive asymmetrical dress and ended up loving it! The material is silky soft, the neckline makes you feel covered and is great for adding a necklace. It’s by Topshop, which runs small, I’m in US4, but could’ve gone with petite to make it a little shorter. A jumpsuit can easily go oh so wrong, like you’re wearing a diaper or worse . . . ?, but this one is good! On the supermodel, it’s ankle length, and on me (5’1, XS) it could still benefit from a slight alteration at the hips. The bodice boning and sticky tabs help keep it up and secure, but I linked my #1 strapless bra just in case.? Dark navy pictured!#holidaypartiesherewecome! ?? Necklace was in my @Rocksbox use code HONEYWEREHOMEXOXO for 1st month free! ? Strapless Bra – Last but not least, hands down, the.best. strapless bra I’ve ever tried! It stays put and actually keeps the girls up. With this bra, your wardrobe options open up considerably! I’ve had mine for several years now and it’s still going strong. I wash it in the regular washing machine and if I remember I’ll take it out and lay it flat to dry, but it’s usually 50/50 that I remember. This is the bra I wear with anything I don’t want the possibility of straps showing, especially strapless tops and dresses. You’ll really thank me on this one! I hope y’all have a great weekend! 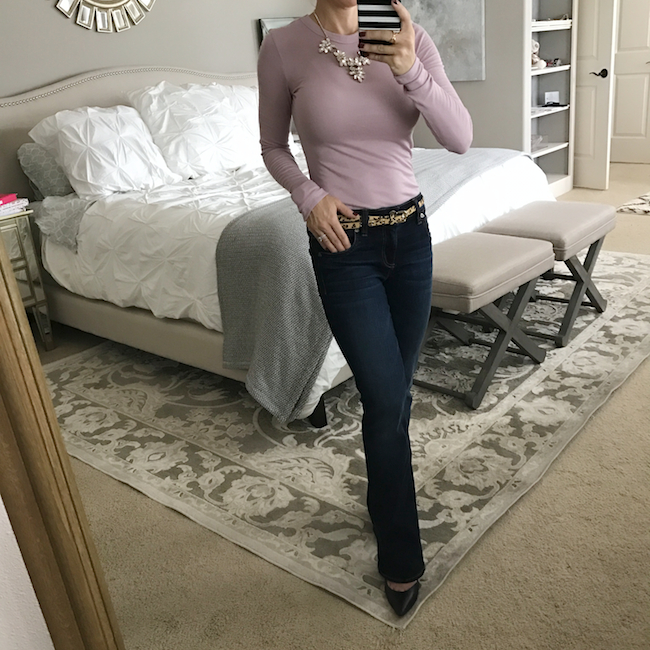 If you’re planning to make progress on your Christmas shopping, check out My 10 Favorite Things here, Gifts for the Girlie Girl here, and my Top Gifts Under $35 here. I love these types of post because not only can I get ideas for outfits but I love that you link directly to the different pieces. I most definitely headed to nordstroms and bought that infinity scarf in the first picture. 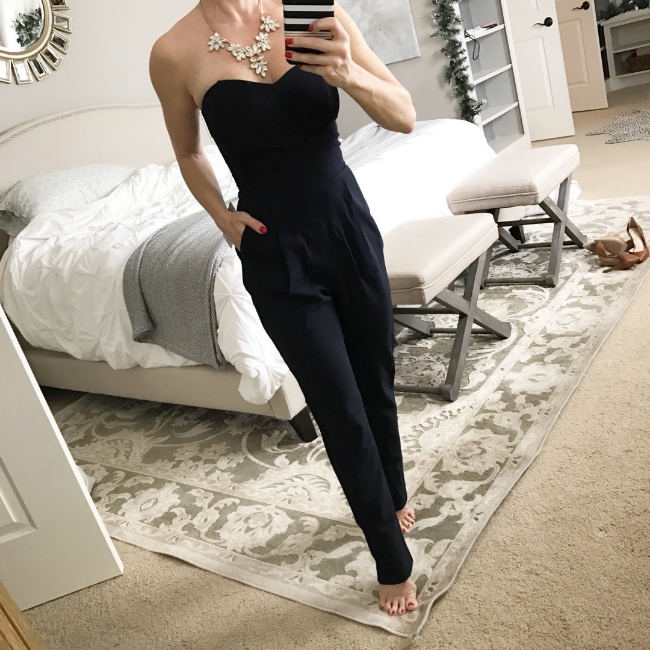 And the jumpsuit…. AMAZING. I will be dreaming of wearing that to next Christmas' parties when I'm not 8 months pregnant. hehe. Great choices as usual. I e been struggling to find a white nail color I love. Thanks for the suggestion! This white is so pretty! Would you mind talking about how you store your scarves – folded in a drawer? Hanging? Something else? I currently have mine hanging on a hanger but it doesn't work very well for infinity scarves. I'd really like to get more (even in Houston!) but don't know where to store them. Thanks! Great outfits. Especially love the jumpsuit on you! I love the lipsticks that you are wearing in the first, second and fourth pictures. Do you remember the ones you're wearing? It's a gloss, but goes on super matte (which is why I like it, it lasts forever!) But then I apply this gloss over for some shine – http://rstyle.me/n/b97v4npz4e "ticked pink". All so pretty, M! I tried to buy the jumpsuit but the black was sold out. I should look again. Have a wonderful weekend, friend! You are so beautiful! All great outfits! I love your lipstick in the first picture! Can you share what you are wearing? I love your blog! I know this is off topic but I wish I looked like you and I was wondering if you ever eat dessert? If so, what dessert do you eat? Thank you so much. 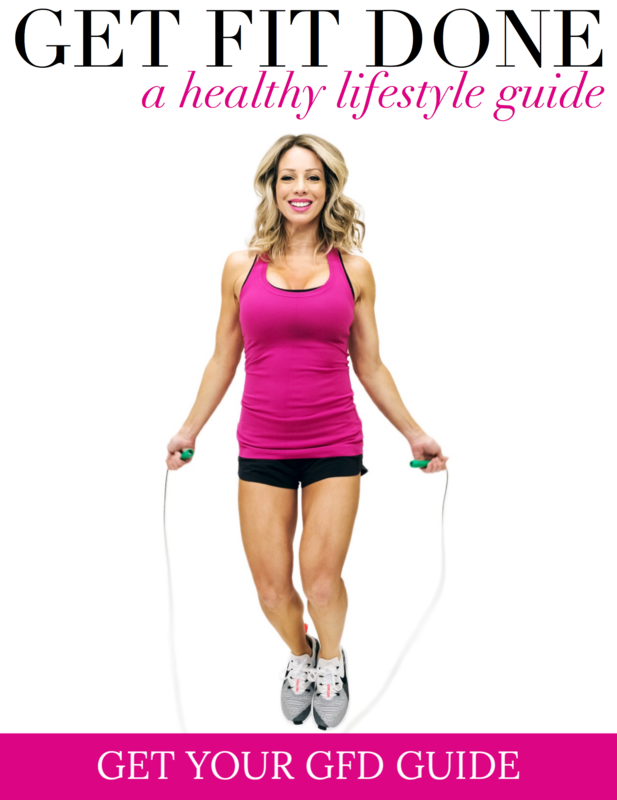 Thank you so much Jennifer- I love hearing you enjoy my blog! 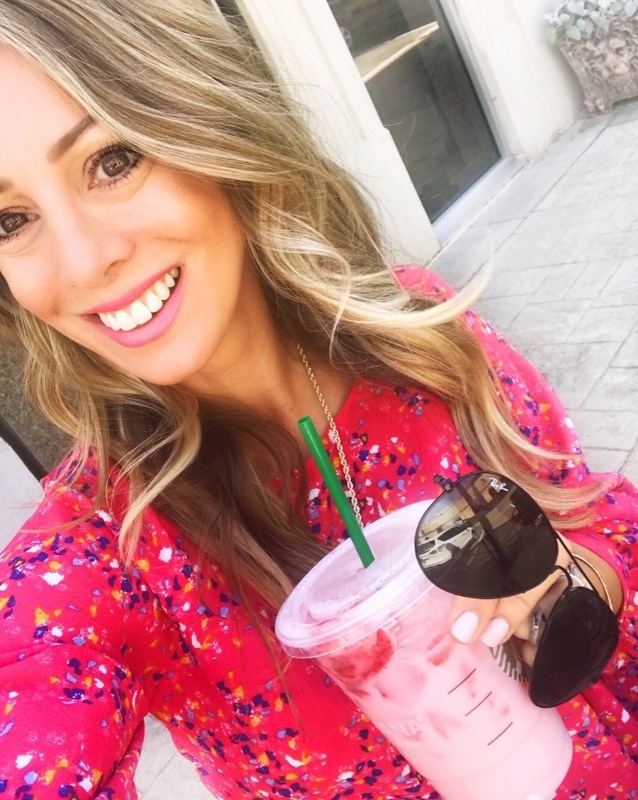 I have the biggest sweet tooth- see today's post for some desserts I love! 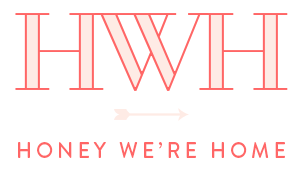 https://www.honeywerehome.com/2016/12/christmas-vacation-traditions-lets-eat.html My go-to dessert is haggen dasz ice cream- caramel cone! Thanks so much!! Merry Christmas to you!